This program helps you to find and save Digital sound files from Web through big collection of find engines to have the greatest effect. This download audio can be performed via every mp3 devices, including iPhone, MP3 player, etc. Just write the title of record or performer, and the program will search numerous of search engines and produce list of relevant data. ...... Millions files of various styles are ready to be found and downloaded. MP3 Search also validates the links and lets you simply keep located files by particular mouse touch without any doubts of not working links or not succeeded downloads. You can find data with wanted quality, file size, and stereo or mono records. * Helps you to find and download MP3 audio records from Internet. * Search via huge collection of search directories. * Brings the superior effect. * All you need is type in the name of music or writer. * Will find number of search directories and produce list of appropriate data. * This is NOT Peer-to-Peer program. This product is absolutely harmless. It s clean of any form of viruses, spyware, adware, etc. * Find data with wanted bit rate, file size, and stereo or mono records. * You may try the searched files before to choose which file to keep. 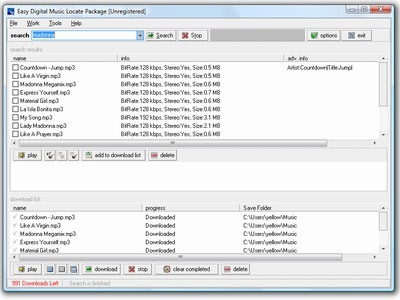 Search and Download MP3 files without using p2p networks. Find and listen to your favorite MP3 music. Download any MP3 for free. Qweas is providing links to MP3 Search 1.3 as a courtesy, and makes no representations regarding MP3 Search or any other applications or any information related thereto. Any questions, complaints or claims regarding this application MP3 Search 1.3 must be directed to the appropriate software vendor. You may click the publisher link of MP3 Search on the top of this page to get more details about the vendor.